Sam Concepcion on relationship with Kiana Valenciano: "We're happy." 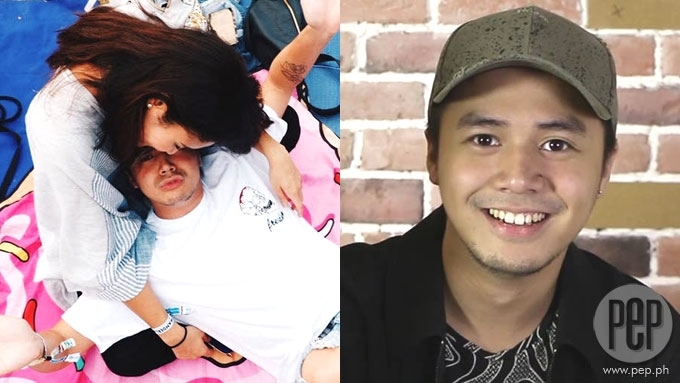 Sam Concepcion on how his friendship with Kiana Valenciano turned to romance: "You know, when it's easy, you don't really have to stress a lot about anything. So, when it just happens, you just go with it, and it's a good thing." Short of putting a label in their relationship, Sam Concepcion admitted that he and Kiana Valenciano are “happy” with their newfound romance. “Yeah, we’re good. We’re doing really well. “We’re having lots of fun. We’re happy,” said Sam during his PEPJams shoot at the headquarters of PEP.ph (Philippine Entertainment Portal) today, March 8. This was in relation to Kiana’s admission on Gandang Gabi Vice’s February 26 episode that she and Sam are officially in a relationship. Sam, for his part, described his romantic relationship with Kiana as something “good” that just happened naturally. The 24-year-old Kapamilya star revealed: “She's one of my oldest friends from my Trumpets days when I was a kid. We’ve always been friends. “And you know, sometimes, things just happen. And, you know, they happen for a reason. “It’s good. You know, when it’s easy, you don’t really have to stress a lot about anything. Can't get enough so stay with me ???? Without going into details, Sam explained why friendship is a "good foundation" in a relationship. He elaborated, "Kasi sometimes, when you meet someone and then you start dating, and then naging kayo, your judgment gets clouded with things. "You get disoriented when things go wrong or you don't understand each other at some level. "When you're friends, you already know the quirks, the little things, the little habits that you guys have. "And it's easier to understand each other and it becomes better to talk about it." Asked how he is as a boyfriend, Sam admitted that he’s “very laidback." He added, "I am very chill. But I like making an effort as well when it counts." APPROVAL OF KIANA'S FAMILY. In a separate interview, Gab Valenciano was asked about sister Kiana's relationship with Sam. "Actually, when it happened, parang sobrang natural lang, e.
"For me, Sam has always been part of the family. He sees my dad as a mentor. Nagkikita kami palagi kapag lumalabas, palagi kaming magkasama. "So, when they got together, parang for us, why did it happen just now? "Yun... Palagi kaming magkasama. We even have family dinners and everything."